You couldn’t pay me enough to live in Bali. I stayed in Canngu for a month and it was the most miserable I have ever been in my life. I’ve lived in African countries, which were much easier to get around in and that were cleaner than Bali. The amount of trash is so bad that I didn’t bother getting into the ocean…dirty diapers were washing up on shore. Unless you know how to drive a motorbike, you are at the mercy of others to get around and walking is treacherous – you’re likely to get hit by a motorist or be bitten by a dog. I agree with some of the underlying issues you point out, although I think there are still truly beautiful areas of the country, and if you do have a motorbike and are willing to live in the center, you avoid the water quality issues and have access to a gorgeous countryside, fascinating culture, and food that I honestly enjoyed far beyond what I tasted throughout most of my time traveling Africa. Thank you so much for the informations. God Bless you. I join bunch of Bali property group on facebook to find decent house to rent but I’m quite shock with the prices. 3bedroom house/vila for 200 million rupiah. Hi Linda! I recommend that you arrive in the country with a place to stay booked for just a couple of weeks and then look in person. There are incredible accommodations that you can find either through word-of-mouth with other expats in these towns, or by simply exploring and asking around with locals. The more affordable places will be locally-offered and often are not listed anywhere online. If you’re not comfortable making the move without a place to stay, consider a research trip where you are still looking and booking in person. Good luck! This is worth reading for. All the information I need to know was here. I’m so excited to visit Bali. Getting ready for the finances though. You are not exactly right, and spreading that information could prove challenging for pet owners. Bali is among the parts of Indonesia fighting rabies and they have at times in the very recent past (2014) forbidden the entry or exit of pets from the island. If you move there, and decide you don’t love it after six months or even a few years, there is no telling what it will take to leave with your pet. Also, the US is NOT a rabies-free country, meaning your pet is facing even more scrutiny than if it arrives from Australia or other rabies-free countries. 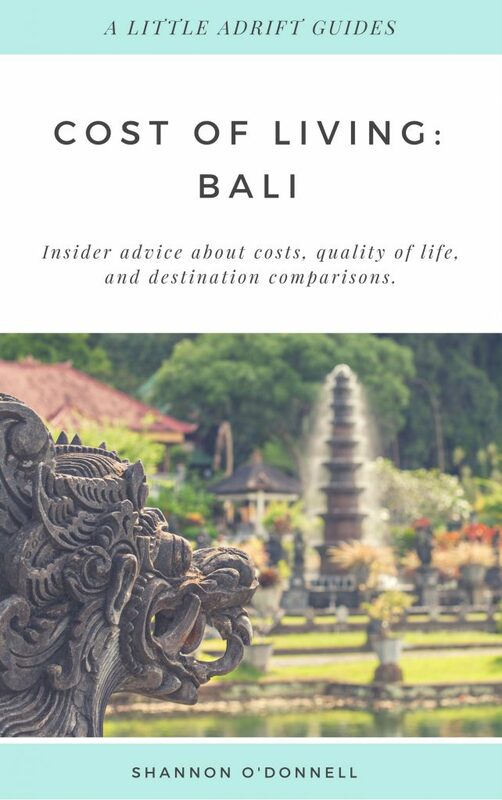 If you are just moving over there for a bit (and my website caters to digital nomads more than retirees, so many leave after a few years), then I stand by the assertion that you should reconsider Bali, either for you, your pet, or both. If you have family or friends back home willing to take in your pet, that could be far better for the pet than trying to rehome it locally months later when you decide to leave Indonesia. And let’s say you get your pet in, when you enter and leave it’s potentially facing quarantine of 14 days (an absolute given if you are moving from Bali back to New Zealand, for example), which some pets will find particularly traumatizing. Yes, there are ways to do it, but nothing is a given in Indonesia—it’s less straightforward than moving to other parts of Southeast Asia that have more permanent and unchanging pet policies. Hi Good Morning! I absolutely adore this page and appreciate it. I am looking to visit and stay in Bali for approximately 3 months. Where are the best recommended places to stay as I would like my budget to stay within $1,000.00 per month. Many thanks for creating this page and I am definitely looking and excited to hear back with recommendations. I live in Barbados and want to getaway for a bit. Good question! You’ll want to either stay in the interior (Ubud or around), or some of the smaller beach towns. It really depends on the ratio of housing to food. If you are content with a small bungalow, then most anywhere will suit and you can spend the rest on good eats and exploring. I encourage you to use the sample budgets I provided and links to their breakdowns to see where your own spending priorities and quality of life might best align. Then there are lots of links providing future research! Hi, so how is an high paying job giving you 500 and the cost of living is 1700? Good question! It comes down to calculating for the average lifestyle of expats. As you can see from some of the examples, some expats live much closer to the average local wage, but for that to happen you often have to chose the right spots (probably not the heart of Seminyak), learn the local language, and eat local food. Most expats net out somewhere on the cost and life spectrum between local and fully Western lifestyles, so the cost of living is higher. Added to that are visa costs, healthcare, and things that you don’t automatically have the right to receive since you are not a local. I live in Spain, and even here my costs are higher than locals because I don’t have the right to the Spanish healthcare system, I have to purchase annual health insurance, and navigate the visa bureaucracy on a yearly basis—it adds up! 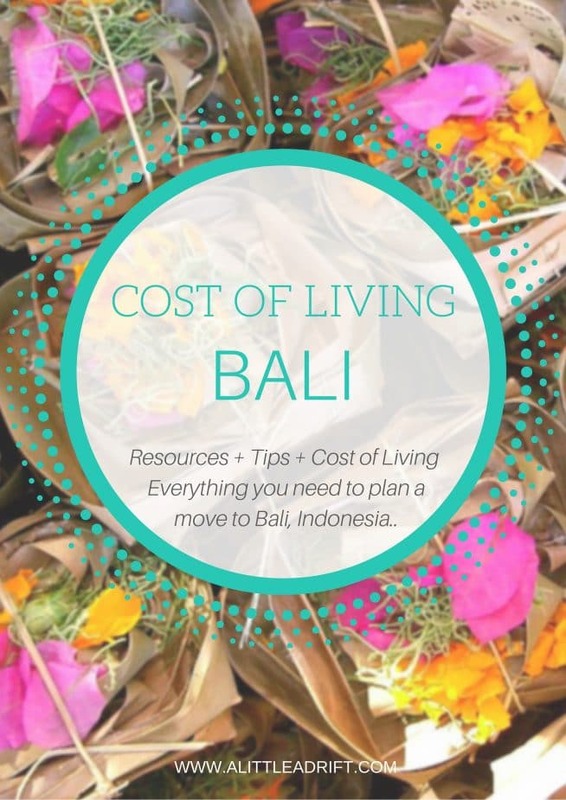 If you are thinking of moving to Bali, it’s these other costs you should look at, as well as your intended lifestyle, when you assess where your own cost of living might net out compared to other expats. Good luck! Hi Nicole, the difficulty is really in the visa. Many countries do not have policies and visas yet designed for digital nomads, so the visa requirements usually account for SS checks as a primary source of vetting and income. There are many expats who have sorted it out, however, so I recommended looking in forums and asking around in Facebook groups for expats in Bali (a quick FB search and you will easily find them!). Best of luck! Hey dear….I am from India. I Have got a job in Bali. My salary would be around 1250 US Dollar. Can I live with my wife by renting a property in Bali in this salary…..???? I am confused please suggest…. Hi Rohit! Thanks for getting in touch. Your salary is definitely enough to cover you in many situations, but it all depends on your lifestyle. Some locals live on half of that salary, other expats spend more. If you have some funds to help you get set up in a place, then I think for many people USD 1250 is enough to make a nice but lowkey life there. I saw 2017 on the title, but mist of the comments are from 2010 s\so I guess out out date? Anyway, had far better internet in Ubub that I get most of the time in Melbourne! Just have to check before you rent. I’m quite surprised about Bali’s internet, but I agree, with many internet projects there just isn’t enough time to spend trying to deal with a slow/spotty connection. Some tasks just need to be done immediately and that requires a certain degree of reliability. The more I travel the more I am surprised by internet connections…places I thought would have good connections sometimes don’t and places where I didn’t even expect a connection at all sometimes offer some of the fastest internet anywhere! I sometimes feel guilty when someone asks me about a place and I comment on how good or bad the internet infrastructure is. But, if you’re there to get work done and settle for a while it’s a different situation than someone just visiting for a short time on vacation. Slow on unreliable can really get super annoying when you’ve got a lot to get done in a day (we’re struggling now, so I empathize). I appreciate the honest write-up – thank you. I’m sorry to hear that you won’t be staying in Bali! This is really valuable advice for would-be digital nomads, though! I guess is all comes down to expectations. People travelling NZ do complain about Internet connection and residents too. Personally I find it part of what makes NZ different and I love it, but I take it might be due to the fact I had enough of high-speed Internet rush in the days I worked in the IT industry. From your description it sounds like Bali is better off then some areas in NZ… But if you rely on good-reasonably-priced Internet connection you need to be located in a place where you can find one and not be frustrated about it on a daily basis. about NZ though, I really hope to make it there in the next year or two! I enjoyed your post a lot. I recently wrote on the topic. In my experience, the local internet service was decent enough to get most tasks done, including video Skype calls, but its really tough to get that quality at Cafes or guesthouses consistently which is odd because its freakin’ Bali! We agree with Stuart’s comment .. adding ‘it’s all about balance’ if Speedy slows down.. go for a walk. It’s Bali. Nice write up, Shannon. We based ourselves & business in central Ubud for a month, and had a similar experience, but did manage to have Skype calls and upload photos with little problem. Speed would slow down occasionally, but it was still do able, and I’d go back to do it all over again. It’s definitely important to ask about the availability of wifi when picking a place to stay, because like Shannon mentions, some of the more popular restaurants don’t allow internet during their peak times (so their tables turn over) and a few guesthouses do shut off their wifi at night. It’s a funny system I haven’t seen often, but it seems to work for them! better…my two weeks there was just TOO brief! I have always wanted to visit Bali. Guess now I would just have to go cold turkey on the internet. Excellent write up! I agree, the internet isn’t stable/fast enough for me to live there full time. Sorry to hear about your experience, but as someone who has run an internet -based business out of Bali for the last two years, the above does strike me as a little off the money. I can’t remember a single occasion where a cafe I’ve been working in turned the WiFi off at peak meal hours — that is just weird! Sure WiFi will vary depending on the place you stay at, but again, in most areas of Bali it isn’t too hard to find a decent connection + 3G modems are widely available, relatively inexpensive and offer better connectivity in more remote areas. As for residents, the need for satellite access passed a year or so back, most now get it either down the phoneline (ADSL) or via a wireless provider like Blueline. Either way it isn’t expensive. speeds…that they kept on throughout the day and night. noting that there are expats living there and managing quite well! Our guesthouse in Ubud would shut down the internet randomly throughout the day and night as well. It was frustrating when you’re in the middle of a skype call to find out that it’s off. I agree that internet is definitely accessible everywhere but not always convenient. Nice review Shannon, it’s good when people mention the bad with the good. I personally would have thought Bali would be better connected as it’s firmly on the tourist trail. Never been myself though. Thanks for this Shannon! I’ve just booked tickets and will only be there for a week – surely I’ll be able to survive with limited WiFi. How about a sim card for an unlocked iPhone? Any chance at getting data for the week from my phone? Good information to have. It’s nice to have a cheap and beautiful place to live, but some contact with the outside world is still necessary. Take heart; I’m sure at some point, Bali will enter the 21st Century with better internet connections. Bali sounds like a compromise of location independence and isolation. But like you said, give it 6-12 months and hopefully infrastructure and costs will lighten up. I had a look into Bali as well for using it as a working base and I agree that the wifi is not as good as other parts of SE Asia. beautiful country! Where did you end up going in SEA? Hmm – I would have to poll Twitter to write that post….hmmmm…good call! Yiikes… here I was already to head to Bali after Shanghai to finish work on a catalogue.. which means internet. I have been readying the LP guides and figured if I stayed around Legion or Kuta for the first part of the journey I would be okay. I will need to download 3MB-6MB files.. is this going to be workable? Is there a place anyoen would recommend around there that does have WIFI in the not-too-pricey range of $35 per night approx?? ?